On the flip side, the 100% merino wool is so soft even for someone like me who's usually allergic to wool. The narrower arm holes and the fit is fantastic for someone like me who has a petite frame. I've ordered the medium size as I prefer a more oversized fit. I can't get enough of stripes too! Haha...I like little L's response. I like their clothes, they are very cool French girl. Kim, it REALLY irks me when I purchase something and soon after, the item gets discounted even more. Grrrr.... I'm trying to be positive by saying yes, I'll get a lot of wear out of this sweater. Holes and all. ShinyPrettyThings, yes, kids especially. They haven't learn to be tactful nor filter their thought processes. You haven't heard what Lil L had said on other occasions. NOT to be repeated. Chicology, honesty is over-rated. 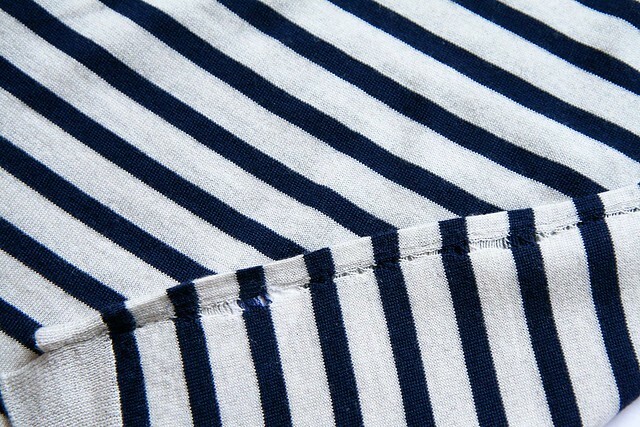 Best to teach Lil L to be more tactful :) I just can't stop buying striped tops too. Tabitha, Z&V clothes are overpriced but really cool. They have an outlet in Chelsea which pop in whenever I'm in town. 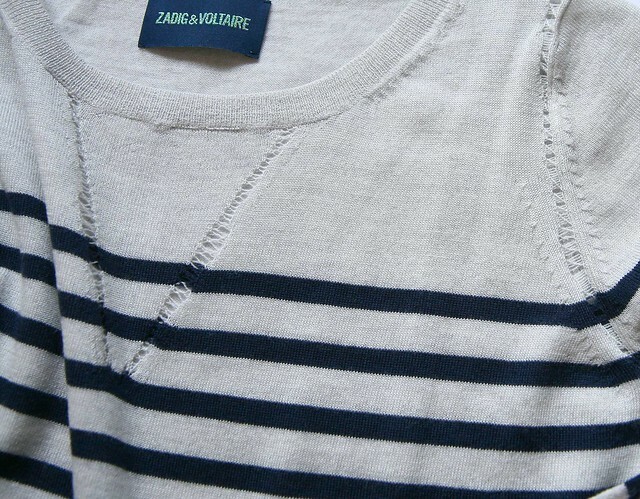 i love zadig & voltaire.. i bought bunch of tops when i was still in paris. i love the quality and the texture! 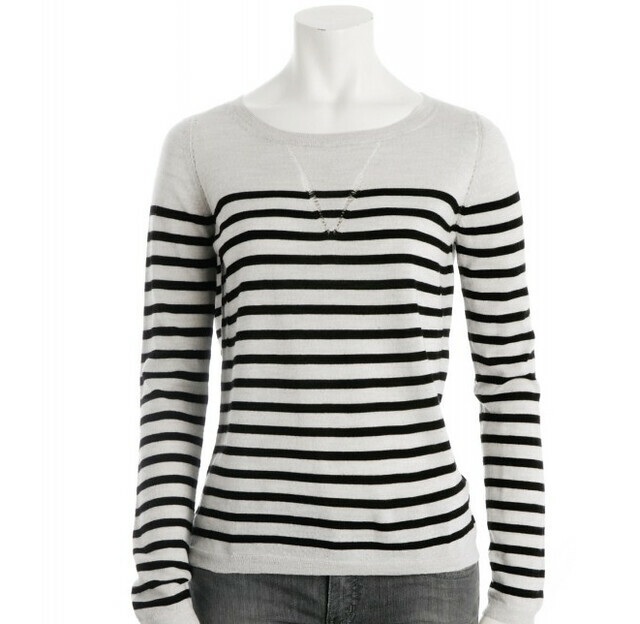 i love stripes too.. i just remember everytime i buy stripes clothes my hubby will just ask me "another stripes?" lol.. I love the sweater, and love Little L's comment! HOpefully she won't go try to put holes in her sweaters to be like Mommy, haha! what a quirky and sweet blog. 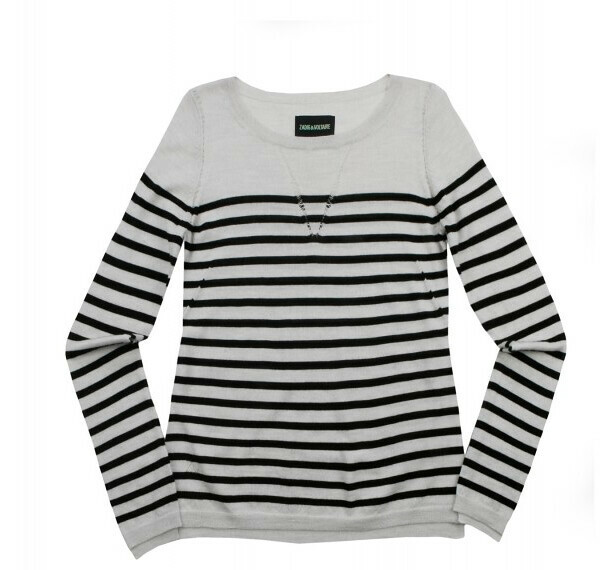 One can never have too many well made Breton striped jumpers, although I do think Zadig & Voltaire can be super overpriced at times.